This fall, The Frick Collection will present a focused exhibition on two important Renaissance paintings by the celebrated artist Paolo Veronese (1528– 1588), St. Jerome in the Wilderness and St. Agatha Visited in Prison by St. Peter. While the paintings are known to scholars, their remote location in a church in Murano, an island in the lagoon of Venice known today for its glassmaking studios and shops, has made them difficult to study. 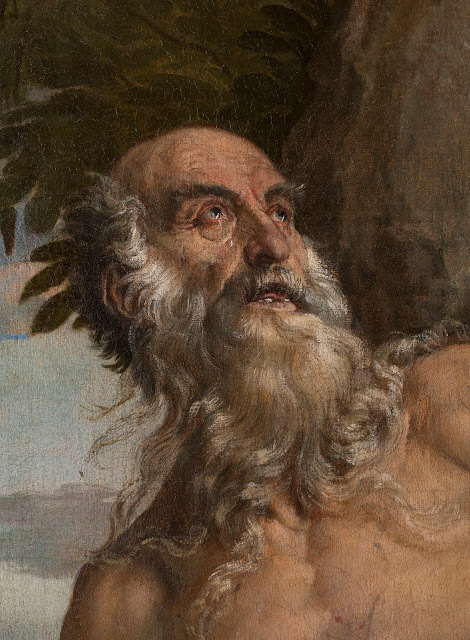 St. Jerome in the Wilderness has been exhibited outside the church only once—in 1939, in the Paolo Veronese exhibition at Ca’ Giustinian, in Venice— while St. Agatha Visited in Prison by St. Peter has not left the church since being installed in the early nineteenth century. the accompanying catalogue), and Venetian Heritage. 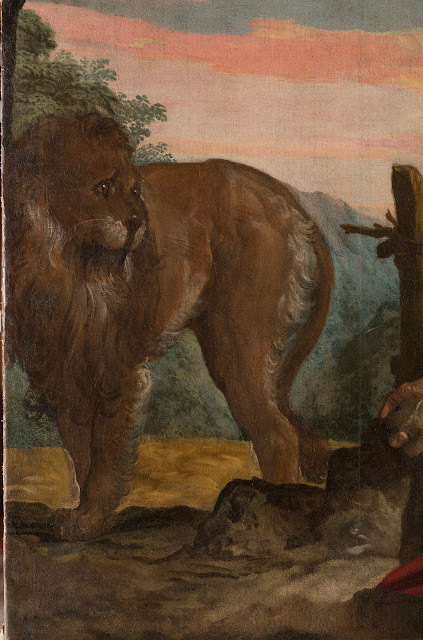 Veronese portrays Jerome in the desert, with trees framing the composition. On the right, wooden beams held together by ropes and covered by a roof of leaves indicate a rudimentary hut, a shelter from the elements. Underneath this structure is a still life of objects traditionally associated with Jerome: a crucifix, an hourgla ss, a skull, and two open books. The hourglass and skull refer to the transience of life, while the volumes allude to Jerome’s translation of the Bible. The saint is an isolated figure in this landscape , alone in his gruel ling devotion. His muscular body is tense, covered only by a red cloth secured by a cord. Toothless and haggard, his face is transfixed as he focuses his tear -filled eyes on the crucifix, while beating his chest with a rock. The bruised ribs are visible, and drops of blood testify to his self -punishment. A divine wind rustles the saint’s graying beard, an extraordinary passage of bravura painting. The faithful lion on the left is the only witness to his frenzied state. Agatha was a third-century martyr from Sicily who lived in Catania at the time of the Christian persecution under the Roman emperor Decius. Of noble origin, she had pledged her chastity to God and therefore would not yield to the advances of Quintianus, a Roman consul, who was enticed by her beauty . Quntianus first tried to bend Agatha to his will by forcing her to live for a month in the brothel of a woman named Aphrodisia. Firm in her resolve, Agatha left the house untouched. Quintianus then commanded Agatha to worship pagan idols; when she refused, he sent her to jail where she was tortured and Quintianus ordered her breasts to be cut off. Left in prison without food or water and with no medical aid, she suffered greatly. One night she was visited by an old man who revealed himself to be St. Peter, telling her he had been sent by God to comfort and heal her. 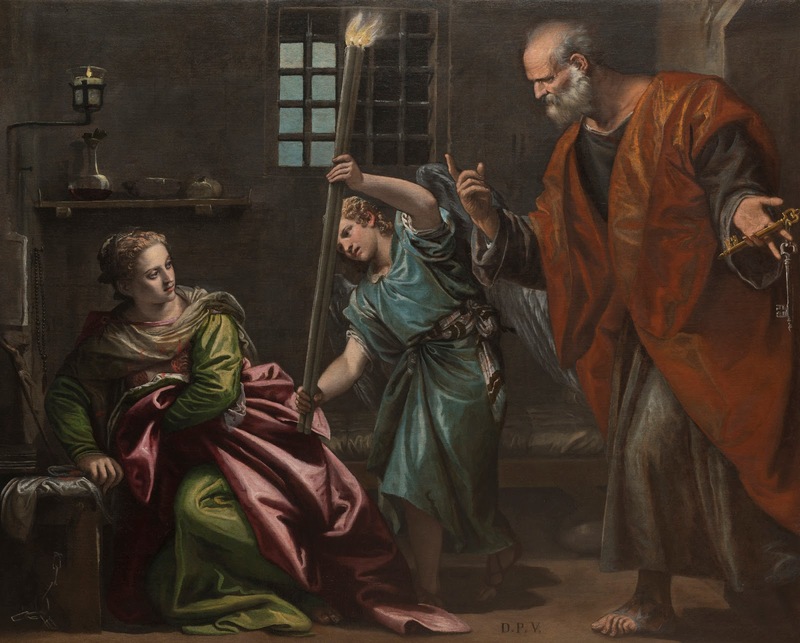 When the jailers were alerted by Peter’s supernatural light, the saint vanished, and Agatha knelt in prayer, finding that her wounds were gone. Quintianus, however, did not desist. He had her placed naked over burning coals, but she was saved by a heaven sent earthquake. Finally, having been sent back to jail, she prayed to God to end her torture, and she peacefully died in prison. 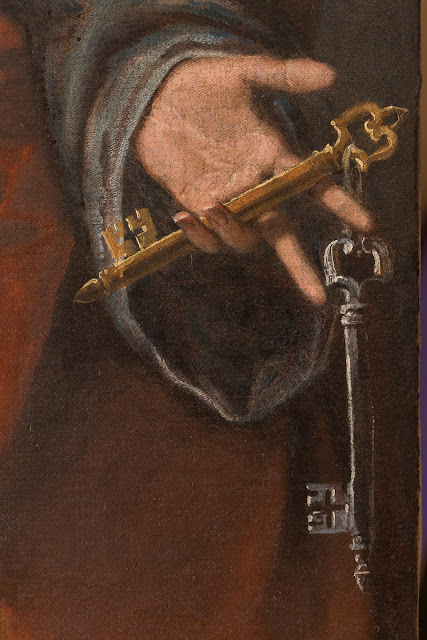 Veronese sets the scene in Agatha’s dark prison cell , which he describes in detail. A high, barred window and a door to the right are the only portals to the outside world. Below the window is a bed, a simple wooden frame covered by a thin mattress; underneath it is a chamber pot. 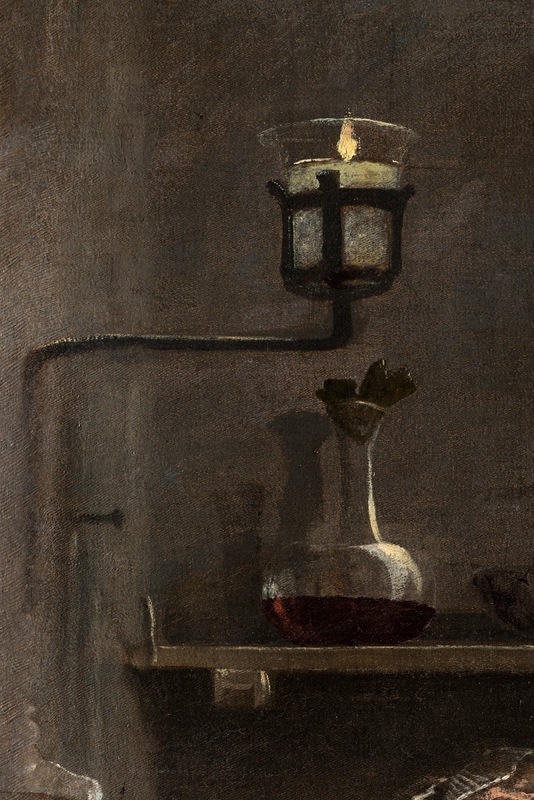 A candle at left illuminates a wood shelf on which Veronese has created a modest yet exquisite, still life: a glass pitcher with red wine, a bowl, and a loaf of bread. Agatha has been interrupted during her prayers in the semi darkness. She is clothed in a green dress and clutches a pink drapery around her. A heavy chain below the bench makes clear that Agatha is a prisoner in this room. With her left hand, she draws a white blood- stained cloth to her wounded breasts. She steadies herself against the bench, surprised by the two visitors that have burst into her cell. A glorious blond angel dressed in light blue holds a long taper, bringing light into the shadowy room. 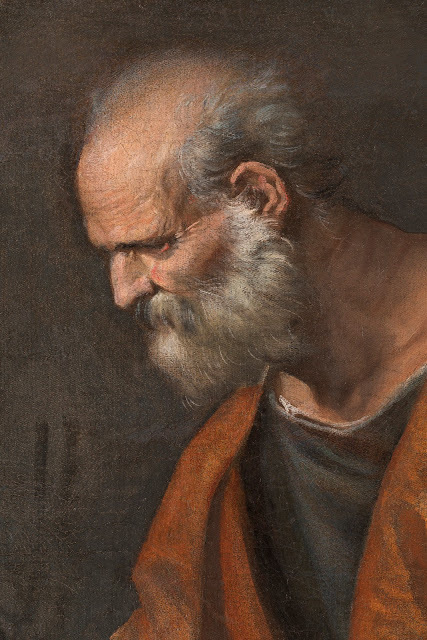 He precedes St. Peter, who stands by the open door, monumentally dominating the right part of the picture. The saint is dressed in blue and burnt orange. In his left hand he holds the keys to heaven (one gold, one silver), his standard attribute. With his right hand he gestures upward, referring at once to his celestial mission and to Agatha’s imminent healing, and possibly to her death and heavenly reward . and Wisdom and Strength for an unknown patron. How a priest on a small island got to know such a prominent painter and came to commission such costly paintings remains a mystery. 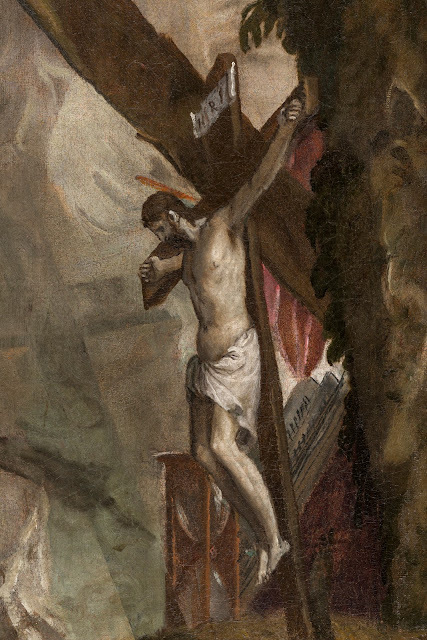 Little is known about Degli Arbori’s life, but the research conducted in preparation for this exhibition has uncovered two important documents relating to him: his deed of gift of the chapel to the nuns of Santa Maria degli Angeli, in 1566, and the priest’s will, written soon before his death, in 1579. In 1667, after hanging for a century in the chapel for which they had been created, Veronese’s canvases were removed. On August 1 of that year, the nuns of Santa Maria degli Angeli, having determined that the paintings were “notably suffering damage from the injuries of time, inside the said chapel” had them relocated to the main church of Santa Maria deg li Angeli. The nuns were also worried about possible theft. 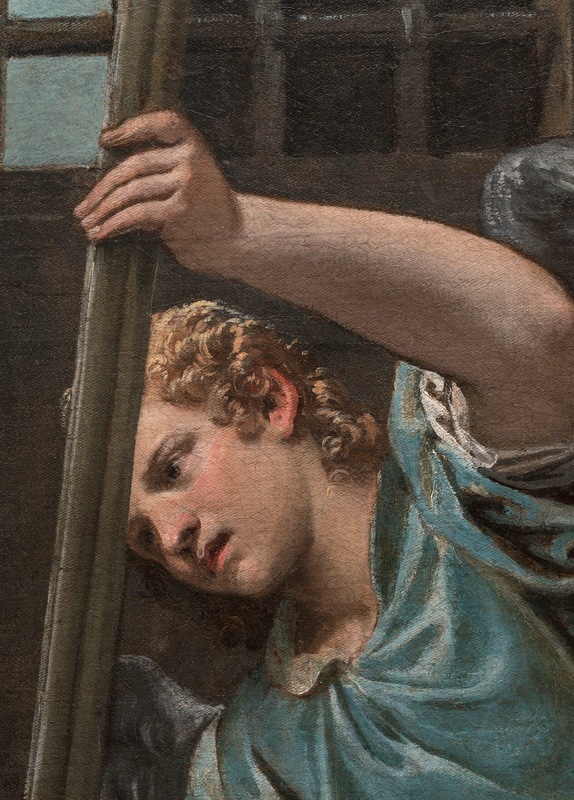 From the second half of the seventeenth century to the early nineteenth century, the works were frequently described by Veronese’s biographers and guidebook authors, who consistently gave their location as Santa Maria degli Angeli. With the fall of the Venetian Republic and the Napoleonic invasion of Italy in the early nineteenth century, most religious institution s were suppressed, and, in the late spring and summer of 1810, the majority of monasteries and convents in Venice were closed. Such was the fate of the nun’s monastery at Santa Maria degli Angeli, which was officially suppressed in July of that year. By 1815, the St. Jerome in the Wilderness and the St. Agatha Visited in Prison by St. Peter had been moved to a neighboring Dominican church, San Pietro Martire, where they have remained. The chapel for which they were originally painted was left empty, abandoned, and eventually demolished, in 1830. The chapel’s stone door, recently identified during research for this exhibition, is the sole architectural element of the structure known to survive. It is visible in the right wall of Santa Maria degli Angeli, presumably embedded there since the mid -nineteenth century. Few examples of free- standing chapels created for single patrons are known to have existed in Venice. The chapel built for Francesco degli Arbori must have been an exceptional structure , and its destruction has meant the loss to subsequent generations of a fascinating site for Veronese’s work . The island of Murano, however, has retained its enchanting character, and the humble monastic cemetery of Santa Maria degli Angeli still remains in its forsaken northwestern corner of the island . After his death, Francesco degli Arbori was buried in the cemetery, and his body presumably still lies there in the small plot of land adjacent to the church. 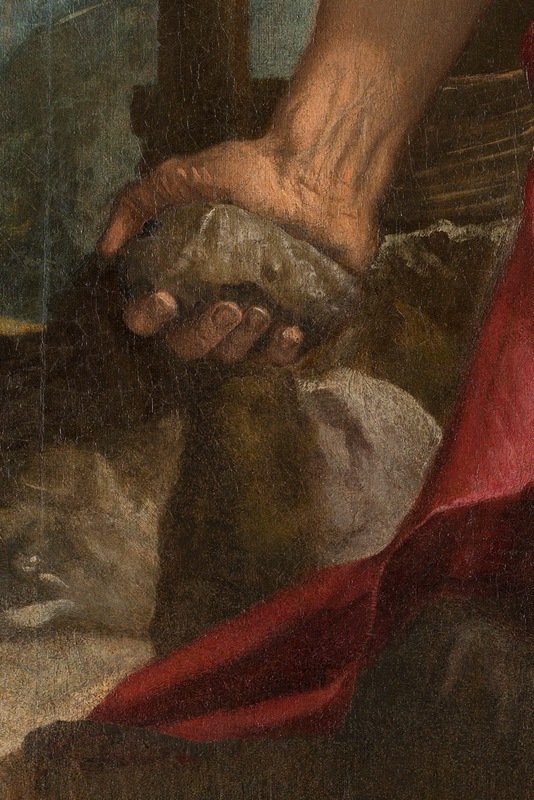 Although the details of Degli Arbori’s prestigious commission remain shrouded in the fog of the past, Veronese’s compositions can be appreciated for their outstanding originality and skillful execution. The recent restoration of both canvases, as well as the technical analysis that accompanied their treatment, will enable future scholars to better understand these paintings and, perhaps, the nature of their commission.